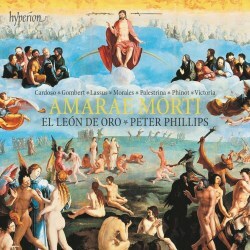 So far as I’m aware, this is the first recording that Peter Phillips has made other than with the Tallis Scholars. I think it may also be his first recording for a label other than Gimell since that label was established nearly 40 years ago. As for El Léon de Oro, whose work I’ve not previously encountered, the choir, which was founded by a group of friends in 1997, is based in the Asturias region of Spain. I don’t know if they’ve made any recordings with their founder-director, Marco García de Paz – who, incidentally, sings as a bass in these recordings – but I’m sure this is their first recording with Peter Phillips, who is their honorary director. Though his primary focus is on the Tallis Scholars, Phillips does conduct other choirs from time to time and his association with El Léon de Oro goes back to 2012. We are accustomed to hearing Peter Phillips direct a small ensemble, both on disc and in concert. The Tallis Scholars usually perform with two singers to a part, though their ranks can be swelled on occasion if the scoring of a particular piece demands it. Here, he is working with a choir of 33 - 9/8/6/8, with two more singers listed as alto/tenor – though it may be the case that not all the singers are involved in every piece, according to the forces required. I think I’m right in saying that most of the pieces included here are ones which he has not already recorded with the Tallis Scholars. At the risk of making a fairly obvious point, the collective sound here produced by El Léon de Oro is richer and fuller than one hears from the smaller number of voices generally assembled for a Tallis Scholars recording. It’s no small achievement on the part of the Spanish singers – and by Peter Phillips as their conductor – that the larger ensemble does not mean an overweight or unclear sound. The same clarity of texture that characterises Phillips’ work with the Tallis Scholars is in evidence here too. There’s quite a lot of solemn, even sorrowful music here. Peter Phillips has chosen three works that set passages from the Lamentations of the Prophet Jeremiah. The programme opens with a setting by the Franco-Flemish composer, Dominique Phinot whose homosexual practices brought about his execution in around 1556. His setting, which is divided into six sections (all separately tracked) is quite remarkable – Peter Phillips describes it as “clearly experimental”. It’s scored for two SATB choirs though it’s only in the first and last sections that the two-choir division is used – and to telling effect. Elsewhere, the third section is reserved for the four upper parts, soprano and alto, while the following section, also in four parts, is restricted to tenors and basses. In the fifth section all eight parts come together in sumptuous music. This piece is a wonderful discovery and El Léon de Oro sing it marvellously. The other Lamentation settings are by Lassus and the Portuguese, Cardoso. Both are very fine settings. The Lassus, for SATTB, is particularly notable for the way he responds musically to the sentiments expressed in the text, a prime example being the dramatic music at the words ‘in die irae furoris sui’ (On the day of his fierce wrath). There are two settings of the Lenten Compline antiphon Media vita, the last line of which, ‘amaræ morti ne tradas nos’ (May you not deliver us to the bitterness of death), provides the title for this programme. The Lassus setting, which is in six parts (SAATBarB), is beautiful, spacious and solemn. In his notes, Peter Phillips draws attention to a detail of the scoring in this work where the sopranos have a little figure, repeated seven times, during the course of which their line drops through an octave. This turns out to be such a simple device, comprising just three notes, but it’s unusual and effective and though it doesn’t stand out obtrusively in the textures, once your attention has been drawn to it the device is ear-catching (track 8, from 1:16). The other setting of this text is by Nicolas Gombert who, like Phinot, was punished for his homosexuality. In his case, though, he escaped death and was instead sentenced to serve time as a galley slave, rowing in the imperial navy of Charles V. Apparently, he continued to compose while serving his sentence – one wonders how – and Peter Phillips speculates that his six-part setting might have been composed in that period. Certainly, the music, which uses the same voices as Lassus, is very intense in nature and if it was indeed composed while he was being punished in the galleys than it’s a particularly significant achievement. It's good – and wise – programming to intersperse some more joyful music into this programme and the three settings of the Eastertide Marian antiphon, Regina caeli fulfil that function admirably. The short, exultant seven-part setting (SSAATTB) by Lassus is a fine piece. The present performance creates a buzzing texture and the choir sings the repeated word ‘Alleluia’ with real joy. Victoria’s setting of the same text is a superb composition. This is for two choirs (SSABar SATB) and in a short span of time Victoria delights us with an array of inventive choral textures. It’s jubilant music to which El Léon de Oro do full justice; they put a real spring into the music’s step. There’s only one piece on the programme which isn’t either by an Iberian composer or one from the Franco-Flemish tradition. Palestrina’s Laudate pueri is a masterly setting for two SATB choirs of Psalm 112. It’s an amazing feat of composition and the present performance is both exuberant and highly polished. It’s a marvellous way to conclude this programme. Lovers of Renaissance polyphony will find that this programme is full of magnificent music from start to finish. The singing of El Léon de Oro is consistently accomplished and full of conviction. I haven’t encountered them before but I’m seriously impressed by what I’ve heard and I hope that Hyperion will record them again. Of course, they could scarcely have more authoritative direction in repertoire such as this than from Peter Phillips. From the online research I was able to do it seems that the Iglesia de Santiago el Mayor, Sariego dates from the fifteenth and sixteenth centuries. Exterior photographs indicate that it’s not too large a building and the session photographs in the booklet suggest a fairly intimate space. It seems to have been an ideal choice of venue and Hyperion’s recording, engineered by David Rowell and produced by Adrian Peacock, is well-nigh ideal. The singers are clearly heard yet with just the right – and not excessive – aura of the church’s acoustic round the voices. The notes are by Peter Phillips, so collectors of Gimell recordings will not be surprised to learn that they are excellent. This is a very rewarding disc and I look forward to hearing more from El Léon de Oro before too long.